Cover photo for the Facebook group "All for Returning Fes to its Status as Capital of Morocco". 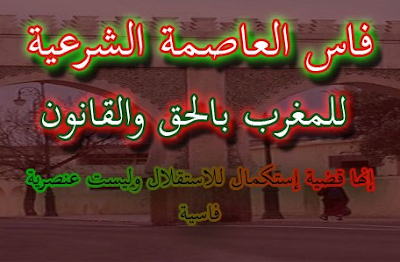 The text reads: "Fes is Truthfully and Legally Morocco's Legitimate Capital. This is a matter of fully realizing our Independence and not Fessi prejudice." Last week, Hespress reported on a Facebook group that's calling for Fes to be made Morocco's capital city in place of Rabat, the current capital. According to the article, the group wants Fes to be restored to the glory it enjoyed as Morocco's political, religious and cultural capital in the centuries leading up to the French Protectorate. As the article states, once the French took control of the country in 1912, they made Rabat their capital to, "distance themselves from the Nationalist Resistance's center and to remove the Sultan from the religious scholars at Al-Qarawiyine mosque." Rabat remained Morocco's capital after Independence in 1956. Hespress reports the group considers this change illegitimate because it came under French colonial rule and asserts that Fes has suffered from its diminished importance in Moroccan politics and society. To the group's founders, a city with such a long, storied tradition should not be banished to social, cultural and political irrelevance. The article articulates the group's demands, or "solutions", which include "recognizing Fes as Morocco's symbolic capital and empowering it as the nation's cultural and intellectual capital by bringing to it national institutes and universities, and by establishing scholarly research centers in the city." They go on to say that, "Rabat should remain the administrative and political capital as is done in Holland. There, Amsterdam is the official and symbolic capital while The Hague is the administrative capital." The article concludes by articulating the group's alternative solution, which is "to recognize both Fes and Rabat as co-capitals of Morocco, officially and constitutionally, dividing administration between the two. Either Fes could be the administrative and political capital, and Rabat the judicial and legislative capital, or vice versa, as is done in many countries around the world." These are interesting ideas, but you don't have to be an expert to recognize that these demands are far from realistic. Nonetheless, underneath this group's fantasy, lies a true and acute frustration that anyone who has gotten to now Fes to a certain degree can relate to. Yes, the city possesses one of the world's grandest and most magnificent artifacts: the Old Medina. But that's exactly what it is: a relic, and a testament to all that the city has lost in the last 100 years. Both French and Moroccan alike sought to marginalize Fes over the past century. In 1956, the newly independent Monarchy settled in Rabat for precisely the same reasons the French did so 44 years prior. Morocco's new, centralized government, supported by a legion of Modernist politicians, was eager to step forward and forget about its former self. The times called for a strong, absolute monarchy, not the feeble sultanate that had been held at bay by Fessi religious scholars and businessmen. So Rabat remained the capital, and the families who built the Fes Medina and made it a center of the pre-Modern Muslim abandoned the city. Names like Bennani, Al-Fassi, and Al-Idrissi left for Casablanca or Rabat, following money and political power. Today, it's hard to find a 'real' Fessi living in the Medina. Most of the current residents moved there in the 1980s from the countryside seeking a better life in the city. This lead to overcrowding, poverty and crime and turned the Old Medina into a slum. It remained home to exquisite artistic, architectural and cultural artifacts, but a slum nonetheless. Now Fes feels alienated, cut off from the development that has struck Morocco's coastal cities. Casablanca, Rabat and Tangier possess a degree of cosmopolitanism and refinement lacking in the country's traditional cultural capital. Fessis complain of being overlooked by the government when it comes to education and urban development. Most of all, the city's artists and literati exude desperation. They, more than others, recognize that Fes is a backwater. That said, noticeable developments occurred in recent years. The World Sacred Music Festival, which began in the mid-1990s, has grown into one of the best festivals in a country known for its festivals. It regularly attracts internationally renowned artists and intellectuals - Tariq Ramadan, Bjork and Joan Baez all made appearances this past year - to say nothing of the 1000s of attendees from around the world. Additionally, the Medina itself has been improved. Many historical buildings have been restored, either by UNESCO or ADER, a Moroccan civil society organization dedicated to restoring the Medina. Dilapidated houses have been bought and renovated by Moroccans and foreigners alike. Even signs have been installed to direct visitors through the Medina's labyrinthine streets and passageways. But too often are these improvements aimed at attracting tourists and not at improving the daily lives of Medina residents. A restored fountain makes a great photograph for a tourist, but has no value to the community if residents can't use it to get water. This is why many beautifully restored fountains quickly become glorified garbage bins. Additionally, the attention Fes gains from its festivals is better than nothing, but it is a paltry replacement for actual sustained respect and admiration by Moroccans and foreigners. Fes would certainly benefit from such appreciation, and in fact it needs it, lest the Medina continue to deteriorate both structurally and in its spirt. Being named Morocco's capital would certainly help elevate Fes to the heights it once occupied, but this is merely a fantasy. However, the fact that an idea like this would gain such attention indicates how it reflects Fes' true desperation. Clearly, the situation must change if Fes is to once again receive the appreciation and attention it deserves. But that change won't occur over night, and is unlikely to come from the government. It's in the hands of the city's residents to change their fate. How that will happen is unclear. But there is no doubt that if Fes remains neglected, its best days are long gone.